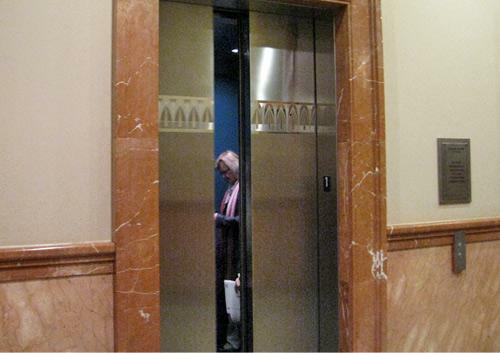 Elevator door closes on FWISD as they head up to a closed session to discuss final Superintendent candidates. The Fort Worth school board has picked a lone finalist for its next superintendent. KERA’s Bill Zeeble reports trustees will make the official announcement Tuesday. Fort Worth’s school board gathered for an open session in a downtown Fort Worth office building lobby Thursday. Then they immediately went upstairs behind closed doors to discuss their two finalists. Board Vice President Juan Rangel, would not say if one of them is veteran Fort Worth educator Walter Dansby, the acting superintendent. Rangel did say the finalist is familiar with Fort Worth, has been a superintendent, and is a Texas administrator. Rangel: We had some very healthy exchange between our board members and arriving at our discussion, and we all feel we have the best fit for the person for the job. Rangel said the next superintendent top priority is dealing with a budget shortfall of at least $30 million. The underfunded budget is a result of last year’s state education funding cuts.